Friday’s matchup between Bishop Miege and Basehor-Linwood will be the fourth meeting in the Class 4A playoffs in the last five seasons. Miege has won the three meetings by an average score of 58 to 2. The Stags and Bobcats met in the 2016 sub-state semifinal won by Miege, 52-0. The visiting Stags advanced back to the semifinal round with a 55-21 road victory over top-seed Louisburg last week. Bishop Miege scored 27 points in the first quarter in taking control. Quarterback Sam Pedrotti completed 12 of 13 passes for 172 yards and three touchdowns, while Brison Cobbins rushed for 81 yards and two scores and also threw a touchdown pass to Phillippe Wesley. For the season, Pedrotti has passed for 1,908 yards and 22 touchdowns against only seven interceptions. Even without 2017 all-state selection Daniel Jackson out for the season, Pedrotti has a talented receiving group led by sophomore Phillippe Wesley and senior Hudson Bentley. Wesley has 38 receptions for a team-high 759 yards and nine touchdowns, while Bentley leads the Stags in receptions with 48 for 707 yards and six scores. Sophomore Jude Putz, junior Connor Doble, and senior Jaylen Scruggs have also been targeted by Pedrotti this season. Cobbins’ effort last week put him over the 1,000-yard mark for the season with 1,058 yards and 18 touchdowns. Junior Deaunte Parker is second on the team with 412 rushing yards. Regardless of the offensive stats, Miege is led by their defense. The Stags gave up only 68 yards of total offense to Louisburg last week, and have been one of the top units in the state this season. Linebacker Dylan Downing leads the defense with 105 stops, 10 tackles for loss, three sacks, five interceptions, a fumble recovery, and a blocked punt. As a team, the Stags have picked off 22 opponent passes. Basehor-Linwood is a team that will likely challenge that Miege secondary with the arm of quarterback Dylan Mussett. Mussett has completed 62 percent of his passes this season for 2,205 yards and 20 touchdowns. He passed for 267 yards and three scores in last week’s 28-7 victory over Paola. The Bobcat receivers are led by Dylan Donnelly who has 49 receptions for 894 yards and six scores. Senior Jacob Coleman, a Pittsburg State basketball signee, has added 39 catches for 574 yards and a team high ten touchdowns. Coleman caught all three of Mussett’s touchdown passes last week. The Bobcats are led by Marlon McDaniel on the ground with 857 rushing ayrds and 13 scores. Senior Nolan Ford can do a little bit of everything on offense with 621 rushing yards, 440 receiving yards, and eight combined touchdowns. The Bobcat defense will have to have its best effort of the season. Senior Jace Friesen leads the unit with 75 tackles including 20.5 tackles for loss and 6.5 sacks, four forced fumbles, and four recoveries. In the summer, McPherson and Goddard were considered the top-two Class 4A west squads in a newly configured classification. While both teams have taken much different pathways, the squads met the preseason ranking and will match up Friday in McPherson. The Bullpups, off to their best season in more than 90 years, lost to Andale in the Class 4A, Division I West sub-state title game last fall. McPherson has never reached a state championship game. Goddard was the Class 5A runner-up two years ago to Mill Valley, and lost to Bishop Carroll in the 5A semifinals last fall. This year, Goddard has played two overtime games with a 17-16 win versus Andover Central and a 23-22 double-overtime road loss to Maize South. Goddard also lost, 27-2, to Maize. The Lions have had multiple other close games, including rival Goddard Eisenhower (12-3), Andover Central in the playoffs (21-7) and a big comeback last week at Wellington, 28-14. While Goddard’s offensive numbers have slipped after significant graduation losses, the Lions have again posted an outstanding defense. Linebackers Dhimani Butler and Kam’Ron Gonzalez lead the team with 91 and 88 tackles, respectively. Junior defensive end Zeke Howell isn’t imposing at 6-foot, 180 pounds, but has had a remarkable season with 21.5 tackles for loss and 17. 5 sacks. Howell has 6.5 sacks last week in the win at Wellington. Goddard has permitted just 134 points, 23 fewer than McPherson, and fifth-best in the classification. The Lions have been excellent in turnover creation with 30 forced turnovers and a plus-10 in turnover margin. The offense is led by sophomore quarterback Kyler Semrad, who has completed 143 of 264 passes for 1,768 yards with a 16/10 TD/INT ratio. Senior Ben Bannister has 158 carries for 1,019 yards and 10 scores. Junior Blake Mitchell has 46 catches for 506 yards and six scores. Goddard trailed Wellington 14-0 at halftime last week and went to senior Jared Macoby at quarterback with a ground-oriented approach. The Lions scored four times in the second half to win 28-14. Macoby rushed for 90 yards and two scores, while Bannister rushed for a team-high 171 yards and a score. This is the first matchup between the teams since four straight regular season games from 2008-11. McPherson captured all four by at least 23 points, according to Kansas Football History. Goddard defeated McPherson, 14-12, in the first round of the 1988 state playoffs. McPherson has rolled through its schedule behind its bevy of weapons, including senior running back Jace Kinnamon, the team’s all-time leading rusher. He has 179 carries for 1,722 yards and 36 scores this season. Kinnamon broke Dwayne Chandler’s 30-year-old rushing record of 3,182 yards. He has 3,261 rushing yards and 53 career rushing scores in his career. Kinnamon broke his brother, Kyler’s record of 1,662 rushing yards. Senior Kyler Hoppes has completed 145 of 212 passes for 2,410 yards with a 34/2 TD/INT ratio. He has 57 career TD passes and has the school mark for single season and career passing scores. Senior Gabe Hoover has 68 catches for 1,235 yards and 19 scores. McPherson has committed just nine turnovers and is plus-seven in turnover margin. Hoover has school marks for single season and career receiving scores (30). Senior Khalil Lisbon leads with 17 TFLs. The Bullpups did play the softest schedule in 4A, according to Prep Power Index, and lead the class with 589 points. McPherson has played with a running clock in 10 of 11 contests. Goddard’s defense will provide resistance, but the Lions will need multiple big plays – likely on turnovers – to swing the game. McPherson is the clear favorite. Two teams with similar philosophies will meet for a chance to play for a state title. Both Galena (11-0) and Sabetha (11-0) are teams build on running the football and playing physical defense. Galena is in the state semifinals for the second time in program history (2009), while Sabetha is the defending Class 3A state champion and is riding an 18-game winning streak. Galena reached the semifinals by knocking off Marysville 42-36 in double overtime, in one of the better games of the 2018 season. The Bulldogs fell behind 24-0 early after the first qurater before eventually scoring 30 consecutive points to lead 30-24 with 2:29 remaining in the game. Galena appeared poised to run out the clock, but an untimely fumble gave Marysville new life and the host Bulldogs tied the game at 30 on the final play of regulation as Jacob Backus caught a touchdown pass from quarterback Brandon Schroedl. Marysville could not convert the ensuring two-point conversion attempt, sending the game to overtime. Shelton was the work-horse against Marysville with over 160 yards rushing on 38 carries along with 95 passing yards with five combined touchdowns. For the season, Shelton has rushed for 775 yards and 17 touchdowns while throwing for 988 yards and 10 scores. Kooper Lawson has added 881 yards rushing with 17 total touchdowns, while Nick Sarwinski has rushed for more than 550 yards and scored 12 times. Standout fullback/linebacker Joseph Helton rushed for nearly 400 yards and eight touchdowns before suffering a season-ending injury back in Week 4. Meanwhile, Sabetha went on the road to Parsons and dominated the Vikings, 62-18. After a 7-6 first quarter, Sabetha scored five touchdowns in the second quarter to build a 42-12 halftime lead. Gabe Garber and Joe Gruber each rushed for three touchdowns in the first half. Sabetha’s Braeden Cox returned an interception for a score to start the third quarter, Garber threw a touchdown pass to Ryan Stapleton, and Tristan Edelmen rushed for a touchdown to give the Blue Jays a 62-12 lead after three quarters. The Blue Jays rushed for 455 yards and seven touchdowns in the game let by Gruber’s 210 yards on 22 carries. Garber added 121 yards on 12 attempts. For the season, Gruber has rushed for a team-high 1,167 yards and 14 touchdowns, while Garber has added 977 yards rushing and 16 scores. Garber has also passed for 858 yards and 11 touchdowns. The Sabetha defense has allowed only 92 points all season, while Galena has given up 103. Last week, Parsons had some success in passing for nearly 300 yards against the Blue Jays, but the Blue Jays had three interceptions and controlled the line of scrimmage overall. For comparison purposes, Galena defeated Parsons 52-14 earlier this season, while Sabetha handled Marysville, 36-12. 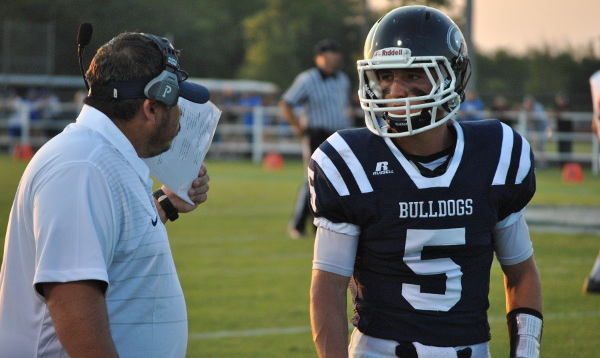 Galena’s win over Marysville gave Beau Sarwinski his 100th victory as coach of the Bulldogs. Win number 101 means the school would play for its first state football championship, but the defending champion Blue Jays are playing well and have the home field advantage. Last week, Class 3A West had four teams that were undefeated: Andale, Pratt, Smoky Valley, and Scott City. Pratt rolled over Smoky Valley, 46-0, and Andale held off Scott City, 35-14. Andale finished as the 4A-I runner-up last season to Bishop Miege, and Pratt captured the 4A-II title two seasons ago. Both squads have dominated opponents in a very deep 3A classification. Andale has outscored teams, 534-69, and Pratt is at 491-88. Andale leads the classification in both statistics, and Pratt stands second. Pratt has averaged 380 rushing yards and 69 passing yards a contest. Senior Travis Theis has completed 28 of 53 passes for 739 yards with a 10/1 TD/INT ratio. One of the state’s best players since his sophomore year, Theis has 176 carries for 2,167 yards and 35 scores. He has plenty of playmakers, including senior Kadence Riner (79 carries, 910 yards and 10 TDs), and senior Brett Winsor (19 catches, 593 yards, 10 TDs). Theis has also served as the primary returner and has 2,434 all-purpose yards. Theis and Riner are 1-2 in tackles with 67 and 66 respectively, and Riner has 20 TFLs. Andale is 5-0 all-time versus Pratt. This is the first meeting between the teams since 2006-07, when Andale went 14-0 both years and captured back-to-back state titles. Andale beat Pratt, 55-7, in ’06 and 44-14 the following year, according to Kansas Football History. Andale defeated Pratt, 19-14, in the 2003 playoffs, and also won in 1997 playoffs (37-34) and 35-7 in Week 9 of 1991. Andale has enjoyed great depth and multiple games with a running clock. The Indians use two quarterbacks with Ethan Baalmann and Easton Hunter and several running backs. Andale’s line features Division I tight end Mason Fairchild, along with senior standouts Ethan Schackelford and Cooper Venjohn. Andale took advantage of early Scott City fumbles as Mac Brand tallied a 25-yard scoring run. Brand added another first half score and eventually finished with 192 rushing yards on 33 attempts. The Indians led 28-7 early in the fourth quarter when Brand broke a 55-yard touchdown run to put the game on ice. Andale held a 288-45 rushing edge on Scott City. Theis is an incredibly rare talent, and Riner is a first team all-state player. However, Andale has depth that’s highly difficult to match at 3A, and gets the advantage up front.